Large square or rectangular rooms work best when carefully zoned. An L-shape arrangement is another option (and may be readily achieved by extending to the rear and knocking through to an existing reception room). 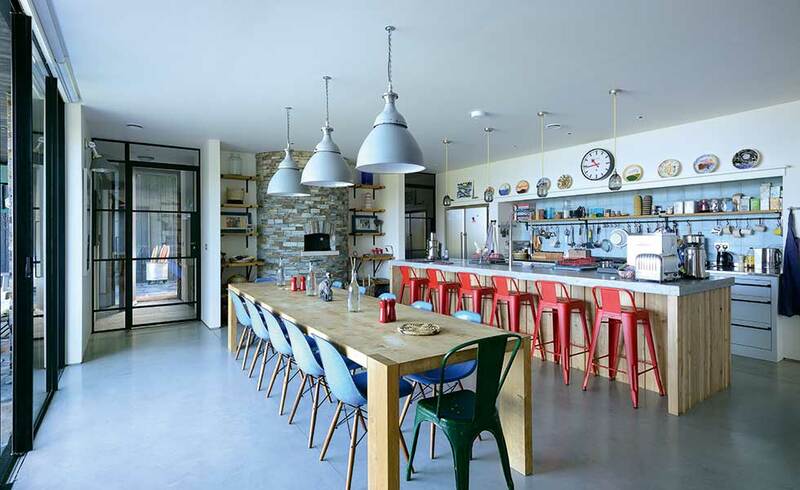 This layout allows a degree of separation between the kitchen and dining space, and often means you’re not in sight of kitchen mess when sitting at the table. Think too about the other activities which may take place in this room. For example, while pendant lights look stunning above a dining table or island, if this spot doubles as a place for the kids’ to write their homework, you may want to consider an additional source of light. Given this room is likely to be the most-used space in the house, maximising potential for introducing natural light is a very good idea. ‘Daylighting’ will inevitably reduce reliance on artificial lighting too. Material choice can also have an impact. 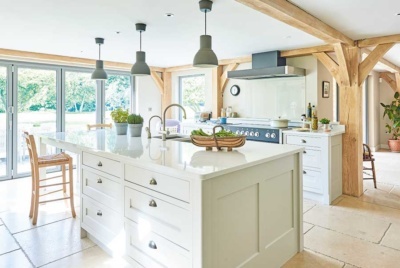 Gloss kitchen units in light colours or neutrals can help bounce light around the space; while light flooring, such as limestone, travertine or pale wood can be beneficial, too. Using a kitchen island or breakfast bar is not only a cost effective way to visually divide the space, but adds surface area and storage. 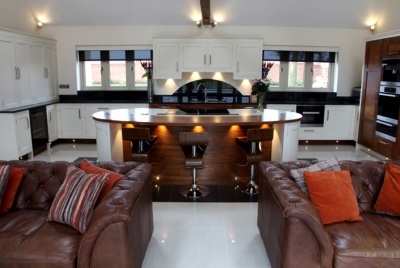 Use different circuits to ‘shut down’ the kitchen when dining, or utilise dimmable lighting to create different moods. A particularly impressive means of creating zones is through creating various levels. 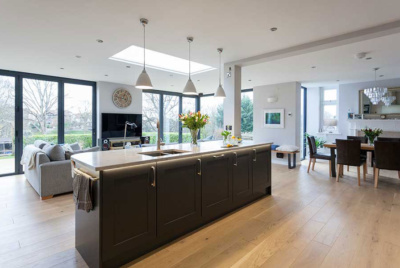 One classic example is placing the kitchen beneath a standard ceiling (say, 2.4m high), with the dining space beneath a vaulted ceiling or double-height space. If you want the same flooring throughout then stone flooring such as slate or limestone is a practical choice. Luxury vinyl tile (in a stone or wood effect) is another solution which is a little softer underfoot. Sitting down for an evening meal or settling on the sofa with dirty plates and pans on view is not a recipe for relaxation. It can be a particular problem when entertaining in an open plan space, too. 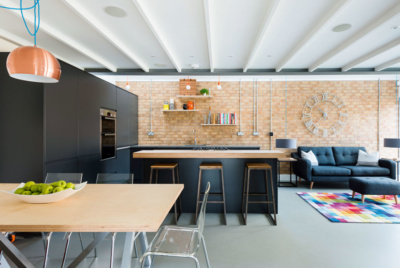 Using a similar palette of materials and/or a unified colour scheme across an open plan space is particularly effective in creating a cohesive interior. 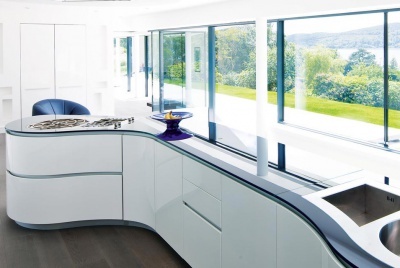 While noise-generating appliances such as washing machines and tumble dryers can be tucked away in a utility, there are some essential pieces required in an open plan kitchen diner. 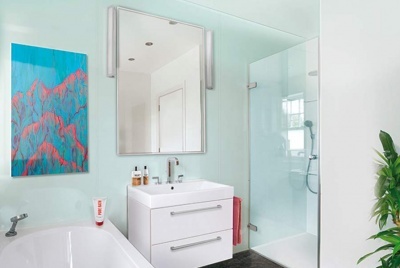 The cooker hood, for example, needs to be both powerful enough to quickly eliminate odours, but also ideally quiet. (Correct ducting and installation are key here). The dishwasher can be another significant source of noise, sloshing away just as you sit down to diner.